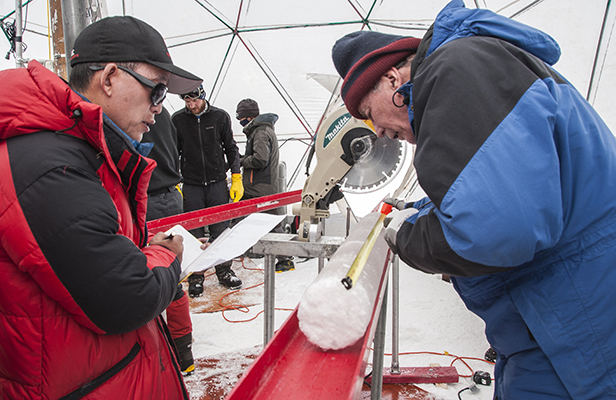 Team leaders Lonnie Thompson, BPCRC and School of Earth Sciences, and Yao Tandong, Chinese Academy of Sciences, are processing an ice core freshly drilled from the Guliya ice cap in northwestern Tibet during a joint U.S. – Chinese expedition in 2015 (see story below). The Byrd Polar and Climate Research Center (BPCRC) is internationally recognized as a premier polar and alpine research center with a rapidly expanding focus on global climate change and environmental issues. This excellence stems from the innovation, dedication and commitment of its scientists, staff and students and strong connections to relevant academic departments. The Center is named in honor of Admiral Richard E. Byrd, America’s most famous polar explorer. The Byrd Polar and Climate Research Center houses one of the most impressive “libraries” of Earth’s climate history and the third largest archive of prehistoric ice core samples in the world. A joint U.S. – China field expedition of around 60 participants from 5 countries recovered 5 ice cores, 4 to bedrock, from the Guliya ice cap in northwestern Tibet. Cores were recovered from a large plateau at around 20,400 ft. and the summit at around 22,000 ft. This ice cap is expected to contain ice older than 500,000 years and thereby provide the longest ice core-derived climate history recovered outside the Polar Regions. The project is jointly funded by the U.S. National Science Foundation and the Chinese National Academy of Sciences (CAS) and is a major project of the CAS Third Pole Environment Program which just opened its first satellite office in the Western Hemisphere at Ohio State’s BPCRC. Sharing knowledge gained by BPCRC researchers with the community through facility tours, speaking engagements, public programs, and online content. Creating novel ways for individuals to engage with scientific information in both formal and informal learning environments. Collaborating with the State Climate Office of Ohio to collect and disseminate long-term climatological data and educate the public about climate change impacts. Developing partnerships with community organizations, local governments, state and federal agencies, and private businesses. David Bromwich, senior research scientist and atmospheric scientist, leads efforts to understand the weather, climate, and climate change in both Polar Regions as key components of the Earth's climate system using observations and advanced numerical models. Lonnie Thompson, professor of Earth Sciences and glaciologist, has led over 65 expeditions to ice caps and glaciers on five continents, retrieving ice cores that contain a diary of past climate conditions around the globe for tens of thousands of years. Bryan Mark (above), professor of Geography and climatologist, leads interdisciplinary geographic research that traces glacier and hydroclimatic changes to better understand the processes and impacts of climate change on different time scales in mountains and other sensitive regions around the world. Ian Howat, associate professor of Earth Sciences and glaciologist, leads efforts to map rapid changes in the Arctic and Antarctic to improve our understanding of how ice sheets that are major contributors to sea level rise are likely to respond to future climate changes. Ellen Mosley-Thompson, professor of Geography and atmospheric scientist, extracts high resolution ice core records whose chemical and physical properties reveal past climate variability and teleconnections between the Polar Regions and the Tropics.